This morning, we went to meet Papa at Home Depot for their free kids clinic. 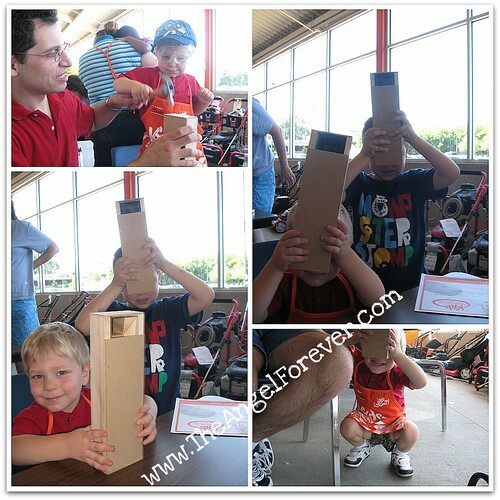 We thought that you might enjoy making the periscopes. Of course, it was fun listening to both of you try to say what you were making and later on made. NHL you kept trying to call it a kaleidoscope, but it sounded more like a tropical disease (at least that’s what Daddy thought). It was a really quick and easy item to make and the two of you really liked them. You were testing them out before we left and kept busy in the car exploring new ways to use them. After we were done, we left Home Depot and went to find a new park that we had heard about. The park has a spray area, playground, tennis courts, HUGE field with several baseball diamonds and more. All three of my boys had fun exploring and getting some energy out before it hit 90 degrees. 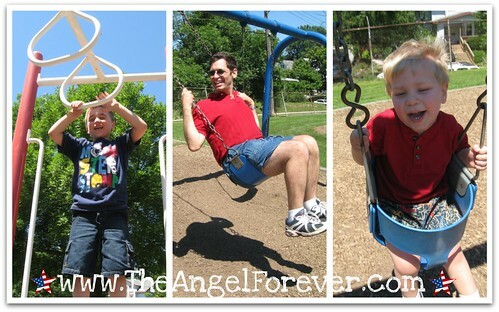 JSL, you absolutely adore the swings. Once we put you in, you were singing Twinkle Twinkle and had no cares in the world. NHL had fun climbing on different items and even Daddy had fun showing how high he could fly in his own swing. Before we left, we went over to the empty baseball diamond. NHL wanted to run the bases. The first time around, the three of you ran. Most of the time, JSL was in the rear going as fast as his little legs would take him. When I realized that my camera goofed and did not capture the original video, you all opted to go again. Here is your second trip around the bases for your own version of a home run. After a nice lunch out, we settled back at home to cool off. Maybe tomorrow we will pull out our little pool to enjoy before going to see TJ (Christina and Tom too) for 4th of July dinner at their place. Let’s just make sure this time we do not have as much excitement as last time. We’ve done the Lowe’s ones too. They’re both fun but the Lowe’s ones seem to be more complex projects. Not bad if you have a bigger kid, but might be more frustrating for smaller kids. The periscope was literally 12 nails hammered in, 2 mirrors slid into place and it was done.